New student residences in central Coventry completed by Pickstock Construction, using a volumetric system to deliver the building in just nine months from planning approval to occupation. 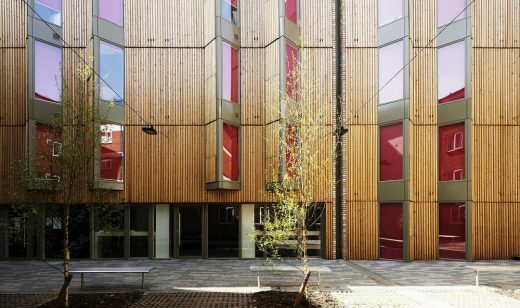 The new building provides 114 new studio rooms and improved communal facilities at Sherborne House, an existing halls of residence operated by Axo Student Living. 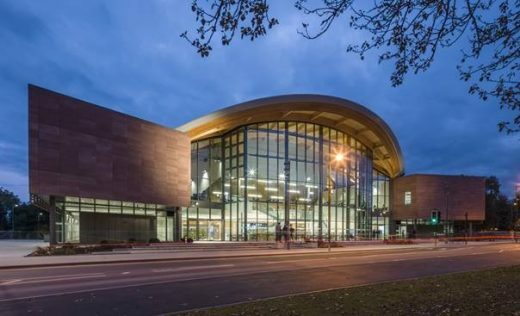 A new visual focal point for the University of Warwick – a teaching centre featuring an impressive 18m tall glazed frontage beneath a striking curved laminated timber roof. The Oculus is the latest addition to the Russel Group university’s main campus and is the first new building in a new phase of development. This is a fortified manor built in the 12th century and progressively extended over the succeeding seven centuries. After a fire burnt out the roof and floors in 1978, its walls decayed and collapsed while a series of rescue attempts failed. In 2006 the Landmark Trust tried a final gambit: the creation of a contemporary house within the footprint of the castle remains, procured by architectural competition. The Shortlist is announced for the competition to design a non-denominational reception building that will provide commemorative services for a green burial site to be created at Alne Wood Park, near Alcester. RIBA Competitions is managing the selection process on behalf of Warwickshire landowner Felix Dennis – who is working in partnership with registered charity The Heart of England Forest Ltd. – to plant and preserve a large native broadleaf forest in the heart of England. The green burial site seeks to complement this overarching vision via an appropriate development which will provide a reliable source of income, increase rural employment, bio-diversity and public engagement with the landscape. This new build primarily serves the departments of Physics and Chemistry on the campus of University of Warwick. With interaction between science disciplines at the heart of the brief, the proposals consist of four ﬂoors of laboratory and office space, below which sits a double height laboratory space for high spec research instrumentation. A plaza links at ground level to the existing principal campus thoroughfare at the upper levels with a new main entrance, reception and light, attractive concourse space which will act as the social hub of the research building.